Not to be confused with Spin Jump, Spin Attack, or Drill Spin. Spinning (also called Star-Spin) is a move that Mario, Luigi, Co-Star Luma, and Rosalina can perform in Super Mario Galaxy, Super Mario Galaxy 2 and Super Mario 3D World, replacing Mario's punching and kicking moves from Super Mario 64. It is done when the player shakes the Wii Remote or Nunchuk. 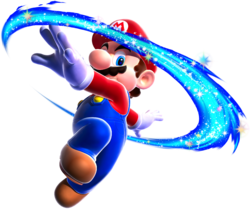 In addition to being a main method of attacking enemies, performing a spin is the only way to activate Launch Stars, which let Mario fly through the cosmos like a comet and reach new planets and galaxies, making it a vital move throughout the game. It can also add some height to his jumps, deflect certain projectiles, activate switches, break Crystals, let him swim faster, and even pick up certain items that are nearby. However, once Mario performs a spin, he must wait a short period for Luma to return to his hat before he is able to spin again, with Luigi's wait time being slightly longer. Also, he can only spin once in midair, as Luma returns to his hat after he lands on solid ground. In both games, Mario gains this ability after being entrusted with Luma's care. Here, spinning is one of Mario's few attacks, with the ability to stun, freeze, or make enemies dizzy by spinning into them. This gives Mario a chance to escape or attack the enemies. Spinning is needed to defeat some bosses. Spinning also causes Mario to skate on icy surfaces. By combining this move with a Long Jump, Mario can chain a spin into a Double Kick, and if he spins in midair and immediately ground pounds, he automatically homes in on nearby objects or enemies. Occasionally, spinning is used to activate or use several power-ups, including the Fire Flower, the Red Star, the Cloud Flower, the Rock Mushroom, and the Spin Drill. Although not necessary for it to work, spinning while the Ice Flower is in effect causes Mario to skate across water instead of walking, and spinning while the Boo Mushroom is in effect causes Boo Mario to become invisible for a short time. Spinning cannot be performed as Spring Mario. Additionally, in Super Mario Galaxy 2, Mario can spin near a Yoshi to ride it without having to jump on it, and when riding Yoshi, the spin becomes a Head Shake, which has the same effect as a spin, except it cannot be used to give him extra height while jumping. Mario can collect Coins, Star Bits, and shells with the spin move. Mario can attract only coins and Star Bits when he uses it underwater or when he uses it as Flying Mario, while he can attract shells in any kind of condition. The ability to attract coins and Star Bits by spinning is actually unintended content that the developers accidentally left in the game. This feature was removed in Super Mario Galaxy 2, as the Red Star is absent from the game. However, Mario can still use it to collect shells. It also appears that after his first defeat in Super Mario Galaxy, Bowser uses the power of a Grand Star to attack Mario with a move similar to Mario's spin. Mario is able to negate this spin by performing one of his own. In Super Mario 3D World, this move is exclusive to Rosalina, and it is performed by pressing or . Like in the Super Mario Galaxy games, the move allows her to gain a bit of extra height when used in mid-air. It is possible to spin multiple times in one jump, though only the first spin gives Rosalina the extra height. Because Rosalina doesn't need Luma to do it, the delay between the spins is reduced. 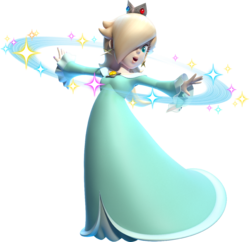 As in Super Mario Galaxy and Super Mario Galaxy 2, Rosalina is able to stun or defeat an enemy. She loses the ability if she grabs a power-up (bar the Super Mushroom, Super Star, and Double Cherry). Mario also uses his spin move in the Mario & Sonic series as his Special Skill since the second installment, where it makes him move faster. In Super Mario 3D Land and Super Mario 3D World, the Tanooki form's tail whip acts like a Spin, but does not give any extra height in midair, has little delay between spins, and can be used continuously while crouching. Spinning in also possible in Captain Toad: Treasure Tracker, although it is done in the same vein as the Spin Jump from Super Mario 3D World, rather than the Spin that is seen in the Super Mario Galaxy games. To make Captain Toad or Toadette spin around, the player has to quickly rotate the analog stick. While spinning, the characters become dizzy and immobile for a brief moment. However, if timed correctly, the move also enables them to defeat enemies that come into contact with them, serving as an alternate form of attack from stomping, throwing Turnips, or using a Super Pickax. Spinning is technically possible in Super Mario Odyssey by way of the Cap Throw move. It behaves exactly the same as a Spin, only damage is now done through Cappy as a projectile. The Spin Throw move is also similar to the Spin, however it has no benefit to Mario's jumping and has a much wider radius. Mario can also do a little spin by jumping right when Cappy returns to him to gain a little height. ↑ Super Mario Galaxy trading card "Mario (Star-Spin)"
This page was last edited on February 19, 2019, at 12:54.